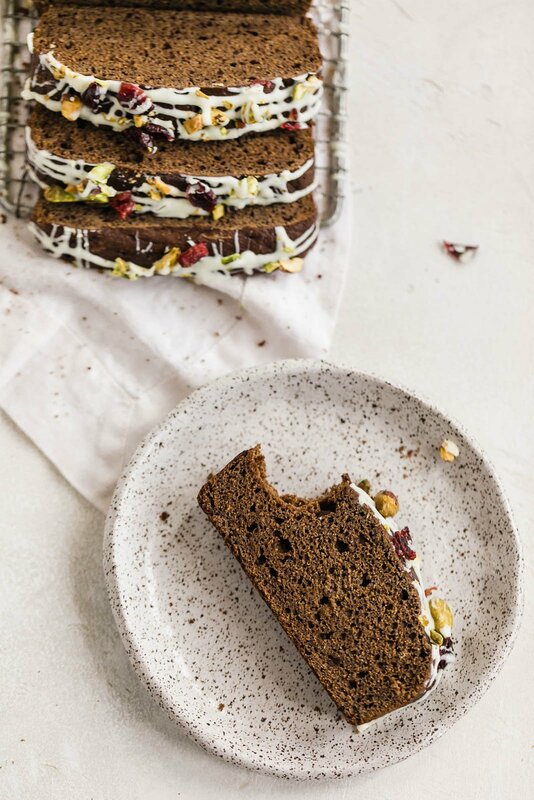 Healthy gingerbread loaf made with whole wheat flour and packed with heavenly spices. This will make your house smell amazing and is perfect for brunch. This weekend was LOVELY and I hope yours was similar. On Friday, we stayed in and watched the movie Moneyball. I hadn’t seen it before but fell in love with the storyline. Saturday was a busy day for us as many of you already know that we’re leaving this coming weekend for our honeymoon! I’ll be gone for 3 WEEKS in Australia & Hawaii so Tony and I spent A LOT of time doing research, booking hotels, and trying to figure out how we were going to make the most of our time there. Finally later Saturday evening we ventured out into the tundra for ice skating at the Park at Wrigley. If you haven’t been and live in Chicago, I highly recommend it (they have hot cocoa and food there too). Yesterday we baked alllll the cookies for Tony’s work. Actually only two of my favorite recipes: brown butter chocolate chip and brown butter snickerdoodles. I realize that I’ve been baking a lot lately but it simply makes my heart happy. 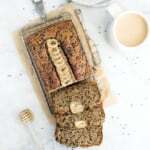 Today I’m sharing a healthier, naturally sweetened version of a gingerbread loaf. It’s spicy, sweet and PERFECT for the holiday season. 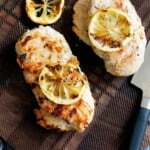 Since I know many of you will request this recipe to be gluten free, I’ve included an option for that located in the notes section of the recipe below! Whether you make it gluten free or note, please know that the recipe is absolutely delicious either way. 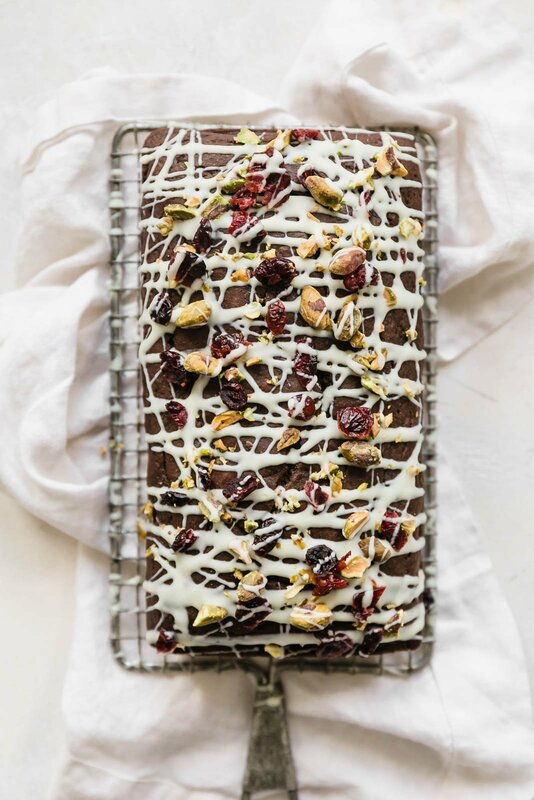 I love glazing it with white chocolate, pistachios & cranberries for a festive holiday look but you can leave it off if you’d like or make it your own. Personally I think an orange cream cheese frosting or glaze would be to die for! I hope you love this healthier gingerbread loaf. 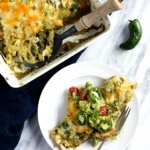 If you make it be sure to let me know by leaving a comment below and rating the recipe. You can also upload a photo and tag #ambitiouskitchen! xoxo! 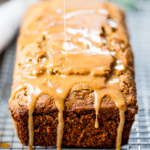 Healthy gingerbread loaf made with whole wheat flour and packed with heavenly spices. This will make your house smell amazing! Preheat oven to 350 degrees F. Line an 8x4 loaf pan with parchment paper. In a large bowl, whisk together flour, baking soda, cinnamon, ginger, cloves and salt. Set aside. In a separate bowl, add coconut oil, maple syrup, molasses, egg, vanilla and almond milk. Whisk together until smooth and well combined. Add dry ingredients and mix until just combined. Pour batter into loaf pan. Sprinkle with a little coarse sugar (this will create a beautiful loaf and a delicious crunch on the outside). Bake loaf for 35-45 minutesor until tester comes out clean. in pan 10-15 minutes before removing and to a wire rack to finish cooling completely. To make topping: Add white chocolate chips (or regular chocolate chips) and coconut oil to a small bowl and microwave in 30 second increments until chocolate is smooth and melted. You can also melt it in a small saucepan over very low heat. 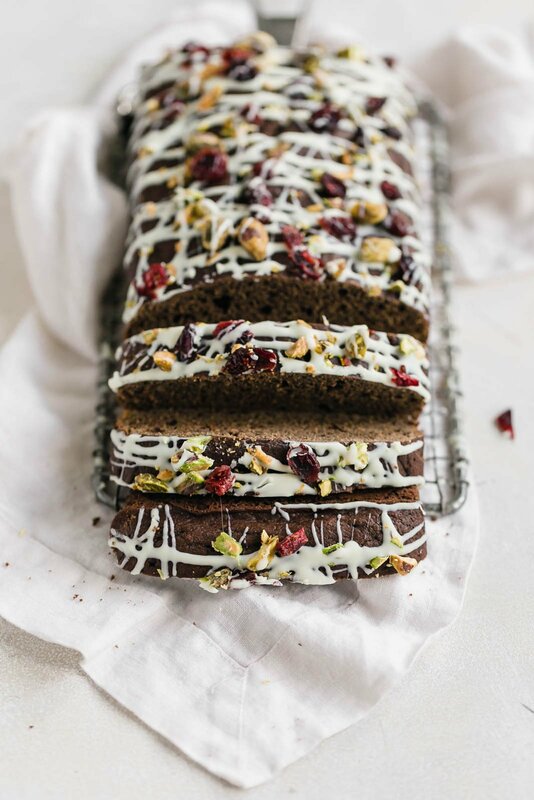 Drizzle over the cooled loaf and top with dried cranberries and pistachios. Cut into 10 slices. 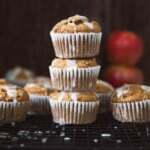 To make gluten-free: Use 1 cup almond flour, 1 cup gluten freeoat flour and 1 teaspoon apple cider vinegar instead of the whole wheat pastry flour. Bake as directed above. To make vegan: I think using a flax egg (1 flaxseed meal + 3 tablespoons water) would work well! 41 Favorite Cookie Recipes To Bake ASAP How to Make Vegan Cashew Cheese Sauce! 40 Responses to "Healthy Gingerbread Loaf"
Ohh I just love ice skating in the winter! If it’s going to be cold AF, might as well enjoy it! 🙂 Love love the look of this loaf! Agreed! Just have to embrace the cold 🙂 Hope you get a chance to try this one! Best way to store this for gifting? I would wrap it in a cling wrap without the drizzle (to add later), or in an air-tight container if you’re gifting it right after you bake it! Amazing!! I can’t wait to go back. Agreed on the molasses and maple syrup this time of year 🙂 Enjoy! thank you soooo much for including a GF option here! Made this last night to share with my bookclub this evening and it turned out wonderful! I found my toppings didn’t stick very well so I’d maybe add them to the batter before baking next time. Crystallized ginger would be a lovely addition as well. Love that there’s minimal sugar involved yet its still sweet and delicious! Will absolutely be baking this again for Christmas. …. just made this, as well as about 6 other of Monique’s simple healthy recipes. The only change I made was add a whole thumb of fresh ginger and skip the topping. I follow her on instagram because her ethos is similar to mine . Healthy, happy and fit! Looking forward to “Ambitious Home”. Loved this! Just made it last night. Your website is great and I’m so happy to have found your website – lots of great ideas.. Congrats! Keep up the great job. Also, just wanted to mention as FYI, your instructions omit using the vanilla, but it is on the ingredient list. I just added it to the wet ingredients. Could a flax egg be subbed for the regular egg? oops! disregard–I see your note at the bottom of the recipe! Yay! It’s true, my house did smell amazing, and that loaf didnt stand a chance. LOve the subtle sweetness, i’m making this again tomorrow to bring to a christmas brunch… thanks! Amazing! So happy to hear that! Brought this to work today & everyone loved it! Will be making more for gifts today 🙂 Thank you & Merry Christmas! Made this loaf and it turned out great! 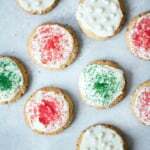 I am a fan of everything gingerbread-y, and this recipe totally satisfies my love for it. It’s not too sweet so the molasses really shines through in this. Thank you for yet another awesome recipe, Monique! Amazing! I’m so happy you enjoyed this one, Jenna 🙂 Happy holidays! 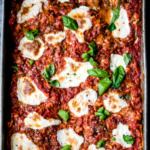 I would love to pin this recipe but can’t due to ads blocking the bar to save. Looks really good. Can’t wait to try this recipe, looks amazing! Any suggestions on what I could use in place of the coconut oil in both the bread and the glaze? Would olive/canola oil work for the bread and perhaps shortening/butter for the glaze? Made these yesterday and they came out absolutely perfect and delicious! I substituted olive oil for the coconut oil in the bread recipe and used shortening for the glaze. Made 2 mini loaves, one for gifting and another for devouring! Absolutely yum and love that it’s healthy too! Great recipe! Amazing! Love the idea of gifting this. Glad you enjoyed! Could coconut milk be a substitute for Almond milk if I want to make it nut free? Yes any milk should work! Hi! Does this need pastry flour, or could I use all-purpose or Whole Wheat Flour? Hi! All purpose will work great! This is a wonderful quick bread. But I especially love what you did with the top! So festive.